This passive intercept monitoring system conducts fully passive real time deciphering of A5/2 and A5/1 encryption keys. For an explanation on the differences involved in choosing a Cellular Intercept system, Contact Us. Our experience with Cellular Intercept can help you acquire the proper system for your region. A passive intercept monitoring system can give the user complete inclusion of all target activities in the operating range. 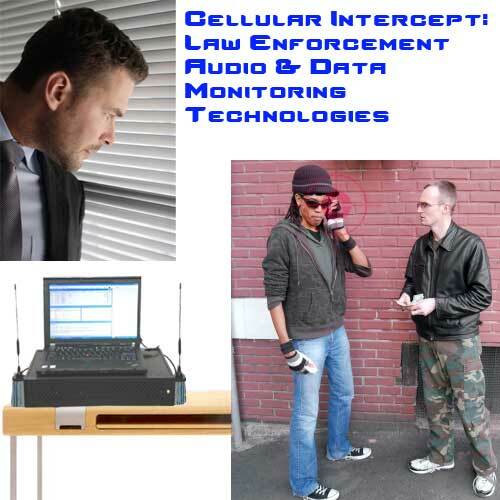 In addition, the Cellular Intercept offers live real-time monitoring of duplex voice calls during investigations. This cellular interceptor model GSM 5000 can accommodate up to 8 duplex voice communications. The actual raw data recording consists of 32 duplex frequency channels. The system is designed using a built-in storage feature on a laptop hard drive for at least 10 days of operation. The System also has optional features such as voice Stress Analysis and Automatic Speaker Recognition. 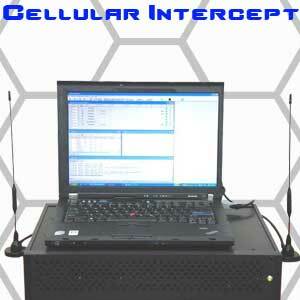 The Cellular Intercept is our most advanced portable GSM interception and monitoring system. We know of no one else who compares to the fully passive interception architecture. Our system is unique in that it conducts cellular monitoring with all variations of GSM networks, with all frequency bands, and deciphers both A5/2 and A5/1 encryption protocols. The GSM-5000RM is a rack mounted version, for Naval Marine Vessels and Airborne tactical deployment. The GSM-5000P is a drawer mounted version, for vehicular monitoring missions (surveillance vans, trucks, etc). The GSM-5000HY is a hybrid between Vehicular and Desktop variation, our most popular tactical configuration. What kind of access to the cellular network is required? The user does not require any access from the cellular service provider or network operator. This is a Passive Intercept System, and leaves no digital foot-print. That means that the Cellular Service Provider is unaware of any activity by the GSM Cellular Intercept. The system is truly an invisible monitoring system. Furthermore, no transmission (towards the Base Transceiver Station i.e. antenna and radio equipment required to provide mobile service in an area) or towards the cell-phone is performed. real-time monitoring of A5/1 calls even for networks which replace the security session key (Kc) during every call. Assume the operator of the Cellular Intercept must capture a specific GSM voice communication, and has the phone number under investigation. Just having the phone number is not enough information, because this number is never broadcast over public airwaves. In a GSM network, a special identity is created for an authentication process of all GSM mobile phone users. Using a proprietary observe and capture process, this cellular interceptor learns the identity to correlate to the specific phone number under investigation. The system logs that number, and stores it in memory that is classified as a target number to be observed. Then the Cellular Intercept observes that number as well as other targeted numbers saved in memory. The system lets the user listen to calls while they are happening, as well as recall voice conversations that were stored. When a target makes or receives a call, the Cellular Intercept indicates this to the user. In addition to the live monitoring, the system collects other data such as the outgoing number the target dials, time and date stamp, duration of the call, and other investigative information. Should a target receive an inbound call, and the caller ID is included in that call, then the Cellular Intercept can obtain that caller ID. At that point, off the air interception will include the voice component of the call from both sides of the communication process. This means the user will be able to hear the target's side of the phone call and the person the target is speaking to. The interception of calls can be monitored, or recorded onto the system's hard drive and saved for future retrieval.